If we count both the main living area (11-feet long by 8-feet wide) and the cabover bedroom (6.5-feet long by 8-feet wide) our truck camper is approximately 140 square feet. According to most sources, the typical tiny home is between 100 and 400 square feet. Put another way, if our truck camper was a tiny home, it would be a relatively tiny, tiny home. Small square footage is not where the truck camper and tiny home comparison ends. Most truck campers and tiny homes are designed to be moved with a truck. Most truck campers and tiny homes require connection to water and sewer lines, but are capable of short off-grid term use. 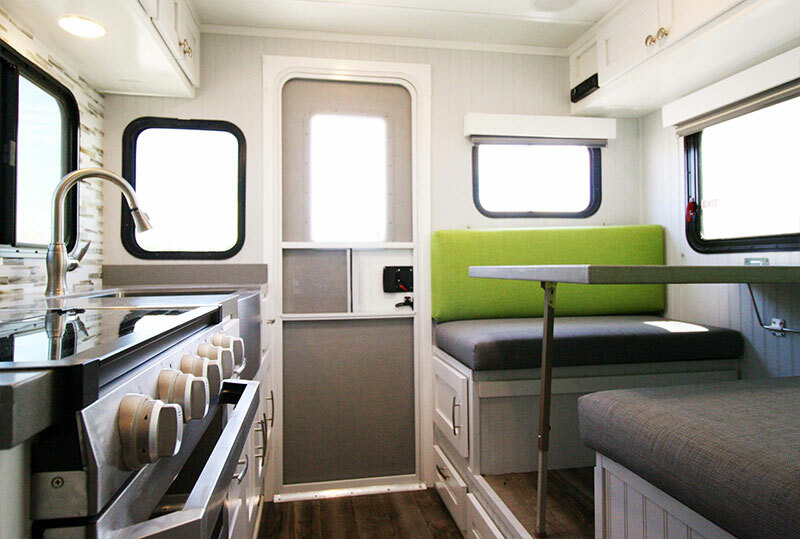 Most truck campers and tiny homes have built-in furniture and storage opportunities throughout. Tiny homes are almost all wood-framed (like most houses) using residential-style construction materials, techniques, and finishes. Tiny homes often integrate RV appliances to take advantage of their smaller size and ability to operate on 12-volt power and/or propane. That said, the way RV appliances are installed looks more residential. Perhaps the difference between tiny homes and truck campers can be best explained with the residential versus RV-industry build approach and styling. Looks like an RV? It’s probably a truck camper. Looks like a house? It’s probably a tiny home. That may sound abstract, but you instantly know the difference when you see it. Throwing a monkey in the wrench is Rugged Mountain with their new tiny home styled truck camper; the Granite RL. This all-new design and aesthetic directly challenges assumptions made by both the truck camper and tiny home marketplaces. The big question is, can a truck camper be a tiny home? With camper jacks and RV connections, truck campers have always made for instant cabins. Maybe truck campers were tiny homes before tiny homes were tiny homes? Or could it be that the way tiny homes are built and finished is so different that tiny homes are their own animal. This QOTW is now closed. Click here to read, “Tiny House Versus Truck Camper“. There are some very insightful responses from readers. Home » Truck Camper Magazine Blog » Can A Truck Camper Be A Tiny Home?